I think it's finally time for swift 4g LTE users to also enjoy what mtn, Etisalat, glo and airtel users have been enjoying for quite sometime now, and that is greater value for their money. 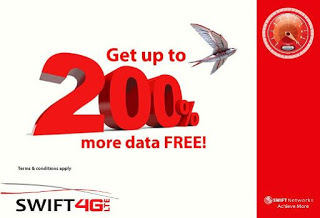 Swift is giving out a very tempting and irresistible extra data to its subscribers who are on the business plan . So if you want to subscribe to any of swifts business plan you will be getting extra 200% more. Below are the new list of available plans and their price. To get any of this offer, just renew your subscription and that's all. Note that this is just a promo and it's gonna end on the 31st day of August.